Made from grain or potatoes, it still is a fine spirit. Most vodka today is made from wheat or rye and is far from the stomach-hole creating liquid associated with the Soviet spirit of the past. Its clear color is a reflection, pardon the pun, of the purity of a great vodka. Not long ago, European Union officials gathered to debate the question posed by the title. One would think that after centuries, the issue would be easy to settle. But legal definitions for purposes of trade and regular names are sometimes two different things. Argue as they will, it isn't hard for others to decide what is vodka. This distilled spirit is made from grain or, sometimes even today, potatoes. While the origin isn't entirely clear, it likely made its first appearance between Poland and Southwestern Russia sometime between the 14th and 16th centuries. Of course, it's possible to make vodka from practically any agricultural product. That's part of what the political wrangling is all about. Grapes, soy and corn have all been used. Sugar beets are a popular choice even today, particularly in the UK, which wants to carve out a chunk of the lucrative and growing vodka market. No doubt, it's easier to grow sugar beets in that cool climate than wheat. But whatever the source, vodka is typically 40% ABV (alcohol by volume), or 80 proof. That's pretty strong stuff, but not rot gut by any means. Higher concentrations containing 50% (100 proof) are available as specialty items. If well made, they can be potent but not ulcer generating, and they still have that fine, pure taste. Some watered down versions that have only 20% are also offered for sale, but the less said about them the better. If you want to dilute your vodka, you can do it with fruit juice or a good vermouth, but at least give the liquor a chance, for goodness sakes. Ok, it's confession time. If distilled vodka weren't already diluted by water to make it 80-100 proof it would be nearly pure ethanol. But there's a limit, no? In any case, the EU sets a lower limit of 37.5% ABV for a bottle to qualify, anyway. Vodka sometimes contains a low percentage of something called fusel oils. They help add a tiny hint of spice to whiskey that every good bottle contains, but the less the better in vodka. They should not be confused with fuel oil, of course, which is the very opposite of what a fine vodka is all about. They're simply a higher order of alcohol, and that phrase more aptly describes this divine liquor. Since the taste of good vodka is so pure, it does indeed make for a great base for many mixed drinks. Bloody Marys, Vodka Martinis and many more cocktails are names known the world over. 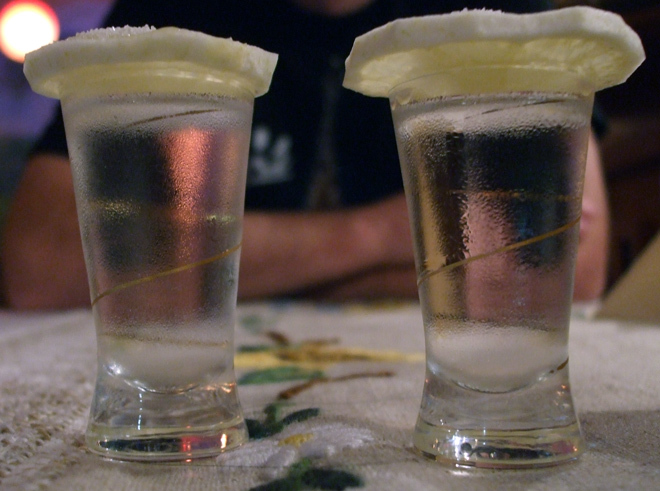 Purists in Eastern Europe may scoff, but every vodka lover is an individual and they don't have to pay them any heed. Leave the arguments to the politicians.